The final NASA shuttle mission has landed, and one of the crew, NASA astronaut Dr. Sandra “Sandy” Magnus, attended the Saint Louis Science Center’s SciFest on October 22, 2011 to tell us more about it. 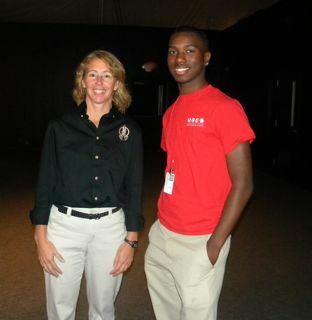 NASA astronaut Sandra Magnus visits Scifest at the Saint Louis Center. Credit: Marquise Middleton. STS 135 took Space Shuttle Atlantis on its final trip to the International Space Station (ISS) and back this past summer. The main purpose of their mission was to take Raffaello, a large pressurized container that weighs about 9,000 lbs to the ISS. 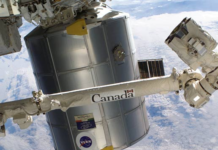 “The Raffaello multi-purpose logistics module, also known as MPLM-2, is one of three multi-purpose logistics modules by NASA used to transfer supplies and equipment to and from the International Space Station,” according to NASA. Raffaello carried food and supplies necessary to sustain the ISS mission well into the coming years. Additionally, Magnus related that two ISS crew members performed a spacewalk to collect and bring back to Earth a refrigerator-sized pump module that failed a year before. This module was designed to provide fluid that they use for the exterior cooling system to keep heat off the station. On board the ISS there was truly an international crew– one Japanese, two Americans and three Russians–when the Atlantis shuttle arrived. She mentioned that together they saw things like volcanic eruptions and the beautiful aurora australis, which is more commonly called the Southern Lights. “I have never been so busy in my life. It was go, go, go, go.” This makes sense as her team had to move 10,000 pounds worth of cargo, like exercise equipment, toilets, bedrooms, and a new water engineering system from the Shuttle to the ISS! A native of Belleville, IL, Magnus graduated from Belleville West High School in 1982. She went on to earn a bachelor’s degree in physics and a master’s degree in electrical engineering from the University of Missouri-Rolla. 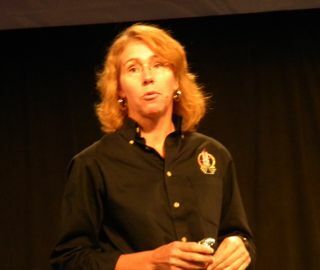 Then she earned her doctorate from the School of Material Science and Engineering at the Georgia Institute of Technology in 1996, and was selected to join NASA that year, according to her official NASA bio. Since joining the astronaut corps, Sandra Magnus has flown to the ISS three times—in 2002, 2009, and on this year’s final shuttle mission. Toward the end of her presentation at SciFest, Magnus addressed a question concerning the future of NASA. She claimed that NASA is debating over the next steps. According to the NASA website, the government agency is in the process of building a new spaceship and rocket, and those projects are expected employ over 2,000 people, and four new spaceships are expected to launch by 2017. SciJourner reporter hangs out with astronaut Magnus at SciFest. Credit: Drew Farrar. Good work as always, Marquise! You made good use of the the audio from her presentation with the quotes you included, and you used NASA well for more contextual details and facts about the STS 135 mission. I love the way you ended the article with the quote about Dr. Magnus’s future! This article was good it had very good infirmation in it .